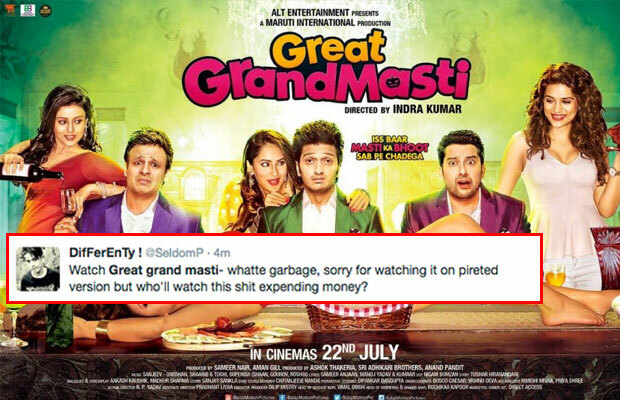 [tps_footer]After Udta Punjab, film Great Grand Masti was leaked online before its release. The adult comedy, which stars Riteish Deshmukh, Vivek Oberoi, Aftab Shivdasani and Urvashi Rautela in the lead roles, was leaked online last week with HD prints available all over on the Internet. As the film was leaked online, the makers of the film decided to prepone the release date of the film from July 22 to July 15. Well, the third installment of this wicked franchise was the much-awaited comedy film of the year but enthusiasts and movie buffs couldn’t stop themselves from watching the pirated version that has made ways on various downloading sites with ‘Censor Copy’ mark on it. The fans have already watched the film online and have been sharing their reviews on social media platform. Being the third installment, we are sure the makers of the film had many hopes that the film will be a hit like the other two parts but unfortunately, Great Grand Masti has made it ways and the review of the film is already out before the release. Helmed by Indra Kumar, the film is produced by Shobha Kapoor, Ekta Kapoor, Sameer Nair, Aman Gill, Ashok Thakeria, Sri Adhikari Bros and Anand Pandit. Previous articleMake Way For Allu Arjun!